Commerce is a widely chosen stream by students throughout the country. So, we thought of sharing some interesting topics for commerce students, in specific. 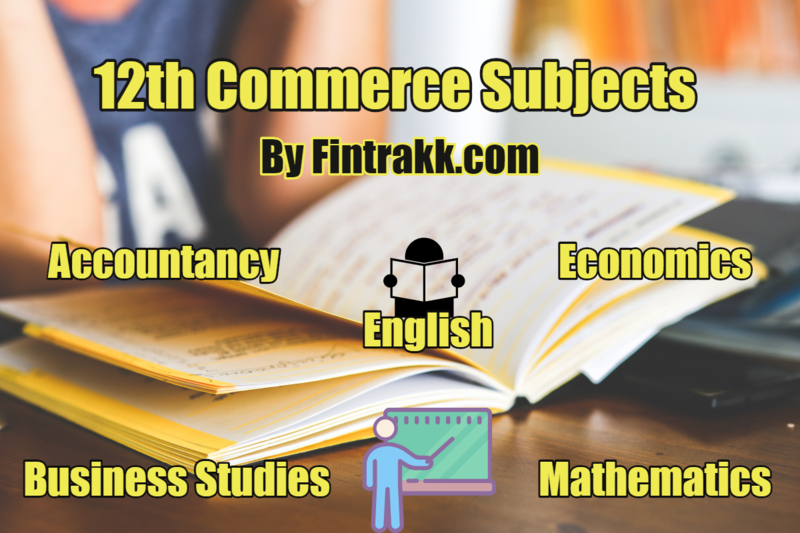 Through this post, you will learn What are the main Commerce subjects in 12th class? Which 12th commerce subjects are compulsory? You’ll also become aware of list of optional subjects after you clear your Higher Secondary School Certificate (HSC) Examination. We have also covered a few useful tips regarding each of the main commerce subject. No doubt, this shall definitely guide you in your upcoming board examinations. A set of simple yet fruitful suggestions, just check them out below! “Board exams” play a significant role in shaping your bright career irrespective of the field you select. However, there’s nothing to be scared off. You just need to move in the right direction to achieve success. Remember, you are not a fresher in commerce now! You must have been trained with the basics of commerce in your 11th class. Since you are preparing for your journey in 12th standard, you must be familiar with the subjects you’ll be studying ahead. You may find few of them as an extension of what you studied in your 11th standard. In other words, these are the next crucial steps towards building a solid career in the commerce field. In general, there are a total of 5 subjects that you need to pursue in 12th commerce. No doubt, Accountancy is the integral part of your commerce studies. Starting from 11th commerce upto all levels of graduation, you’ll have to study Accounts in one way or the other. So, be ready to find solutions to a lot of practical accounting problems. In fact, if you wish to score higher in commerce stream, just have your stronghold on accountancy. Being more of a practical subject, you will surely gain maximum out of it. Keep your basics clear and this shall indeed become one of your favourite subjects in commerce. Moreover, Accountancy is the foundation stone for some of the Best Courses after 12th Commerce. Useful Exam Tips: Get your calculations right while dealing with this subject! Pay attention to numerical questions, revise your formulas and practice a lot. This way, you can score really well. And yes, don’t forget to grab some theoretical part, in case you wish to outshine the theory portion. Through this commerce subject, you shall have a good understanding of business management. In addition to it, you can have a thorough knowledge on the business practices and principles of management. Learn a number of handy ways to see and interact with the diversified business environment. Useful Exam Tips: If theoretical learning is your plus point, you get in a better position here! So, understand definitions, meaning and logic behind different business related terminologies. A lot of theory to read in this. A bit of numerical portion here and there. Moreover, “Presentation” of an answer matters the most and you can impress the examiner straightaway. In your 12th commerce, you are mature enough to widen your learning horizon. So, now is the time to know the broader economic realities of the nation. Get ready to embrace deeper insights on a wide range of economic concepts and acquire requisite analytical skills. ALSO READ Best Courses after 12th: Creative Career options to look for! Introduction, simple economy, market economy, organisation of economic activities etc. Theory of Consumer behaviour: law of demand, shifts in demand curve, elasticity etc. Production & Costs: Law of Diminishing Marginal Product, Law of Variable Proportions, returns to scale, short run & long run costs etc. Market Equilibrium & non-competitive markets. Useful Exam Tips: Economics is a vast subject and shall take up a lot of your time. So, plan well in advance to avoid any last minute rush. Improve your logical reasoning skills and emphasise on the importance of diagrams, charts, tables & graphs to present your point. In fact, nicely presented graphs and charts supporting your written answers is indeed a perfect combination. With increasing urge of English proficiency throughout the globe, improving core English skills is all the more necessary. Therefore, this subject promotes advanced language skills and enhances your confidence in the real world. Useful Exam Tips: Grow your reading and writing skills. You’ll have to manage lengthy text, so brush up your vocabulary and grammar. A set of short and long form answers to be submitted in the given time frame. So, get quick on reading long passages meant to test comprehensions. You have to select a 5th compulsory subject out of the numerous options. Mathematics/Physical Education/ Information Practices: You can pursue Commerce with Maths or without Maths based on your interests. Now, if you choose Maths, it becomes your 5th main subject. But, if you are not comfortable with Maths, you can pick up another subject of your choice. Other languages based on the state where you reside. Important: The detail given above is the shortened version of the actual syllabus for each subject. This is to give you a brief idea of the kind of topics you’ll have to study in 12th commerce. For in-depth syllabus, do refer your college/university where you have enrolled. Also, please confirm beforehand, if a particular combination of additional and optional subjects are offered in your school/college/university. This might vary a little as per availability. Hence, this was our Commerce subjects list for CBSE students. Hope you got a brief idea of the different subjects in 12th commerce. To conclude, we can say it’s not that difficult to crack the 12th commerce board exams. All you need is great determination, a systematic strategy and sincere efforts. In addition to it, a regular study routine can really do wonders. So, don’t just wait for your examinations days to approach. Go and make a study schedule right now. Follow a disciplined routine to perform well in your exams. All the best! Moreover, your 12th standard is the foundation for a promising career route ahead. And, if this is strong enough, you can achieve success very easily. Now, if you choose a simple course or go for a creative career option, both ways your education base must be very solid. So, what are you study plans? Now, that you know the intricacies of 12th commerce subjects, you can figure out how to manage things. For any query or feedback, you can share it in the comment section below.